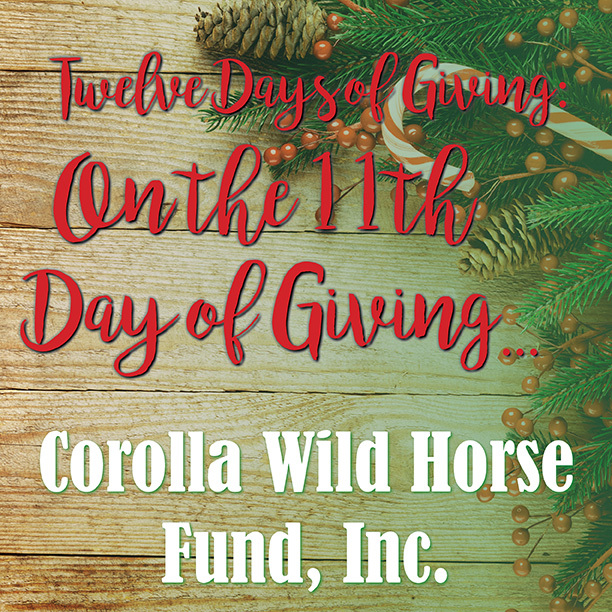 Twelve Days of Giving: Corolla Wild Horse Fund, Inc.
Organization: Corolla Wild Horse Fund, Inc. This organization’s mission is “to protect, conserve, and responsibly manage the herd of wild Colonial Spanish Mustangs roaming freely on the northernmost Currituck Outer Banks, and to promote the continued preservation of this land as a permanent sanctuary for horses designated as the State Horse and defined as a cultural treasure by the state of North Carolina. In honor of Kelley and Julie from Seaton Hackney Stables, I sponsored two horses, Buster and Noel, for eleven months (ok, it’s really a year but…we’ll just say eleven months to complete the song). This mother-daughter duo remind me of another mother-daughter duo. They rescued two mustangs and have hired Cat to train them. Their unwavering faith and support in both the mustangs and my daughter is amazing. Since I already hit up the wild mustangs out west, I wanted to include the wild Spanish mustangs on the East Coast in our giving. Hopefully they can visit the sanctuary with their little ones, Charley and Dean.